Kinase Chemistry – Just a year and a half behind the times. 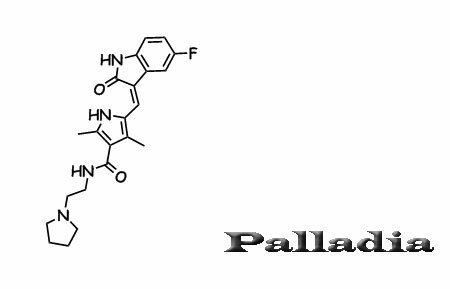 aka Palladia, PHA-291639, & SU11654 got its FDA Approval today! Well… In dogs at least:. It’s for canine mast cell tumors. aka nilotinib, AMN-107 is a Novartis‘ follow-on to Gleevec now approved for CML. So what are they worth? TotallyMedicinal’s got the low-low. TY TM for data: mirrored here. Nothing new to see here, but its about time I got around to it. Here are the currently approved small molecule kinase inhibitors, with a few quick facts and links for each. Xcovery’s got what they’re worth. Tykerb® , Sprycel®, Sutent®, Nexavar®, Tarceva®, Iressa®, and of course Gleevec®. Discovery: Sugen: Provisional filed February 15, 2000 WO/2001/060814. Sugen was bought by Pharmacia-Upjohn which in turn merged with Pfizer. Discovery: Pfizer WO/1996/30347. Pfizer turned over the rights to OSI to meet U.S. FTC requirements related to Pfizer’s merger with Warner-Lambert in June 2000. The drug is jointly marketted by Genentech, and OSI. FDA has approved new labeling for Iressa that states the medicine should be used only in cancer patients who have already taken the medicine and whose doctor believes it is helping them. New patients should not be given Iressa because in a large study Iressa did not make people live longer. There are other medicines for non-small cell lung cancer (NSCLC) that have shown an ability to make people live longer.